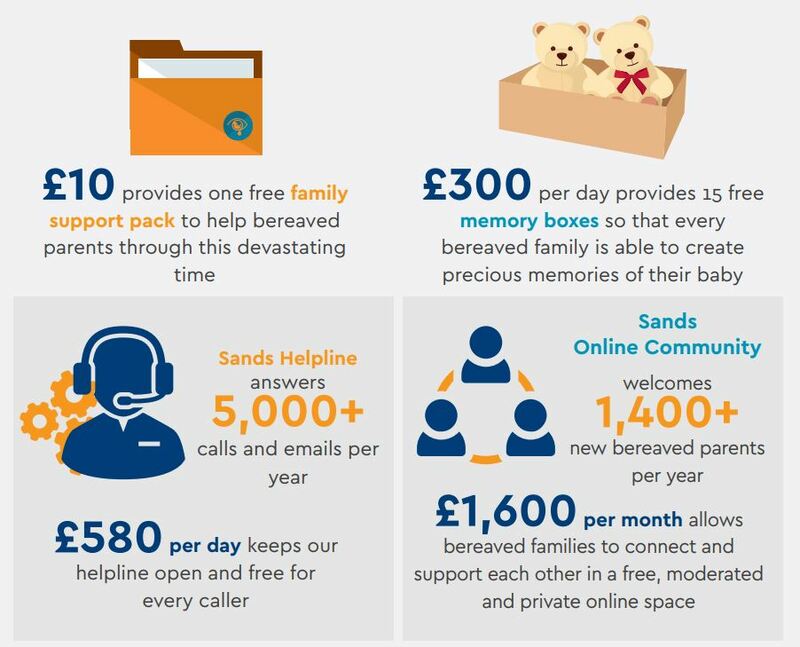 Donate to Sands by Phone: call us on 0203 897 6092. Download a donation form. Don’t forget to Gift Aid your donation. Text 'SANDS' and your chosen amount to 70085 to make a single donation. You can give £3, £4, £5, £10, £15 or £20. Text 'SANDSREG' and your chosen amount to 70085 to make a regular donation. You can give £3, £4, £5, £10, £15 or £20 a month. Payroll giving: a tax-effective way to support our work. Contact our fundraising team for more information. Fundraise for us: There are all sorts of fun ways to get involved and raise money for Sands, from sponsored events and campaigns to bake sales and race nights and much more in between. Our Fundraising Team can offer you help and advice for your event. Funeral or in-memory collection: Contact our Fundraising Team to order our special pew/donation envelopes. Sign up for Gift Aid: Gift Aid is a simple way to increase the value of your gift to us - at no extra cost to you. If you pay tax in the UK, then Sands can reclaim 25% on the value of your gift. So, if you donate £100, it is worth £125.00!